Isn’t the plural form mice? This entry was posted in Food, Hotels, India, Life, Maharastra, Mumbai, Travel and tagged Asia, Culture, Expat, Food, Humor, Humour, India, Life, Lost in Translation, Maharashtra, Mumbai, Restaurants, Travel by Kiwigypsy. Bookmark the permalink. For 5 people and all the fish we had it was quite cheap. Would have cost me 3 times that back home! 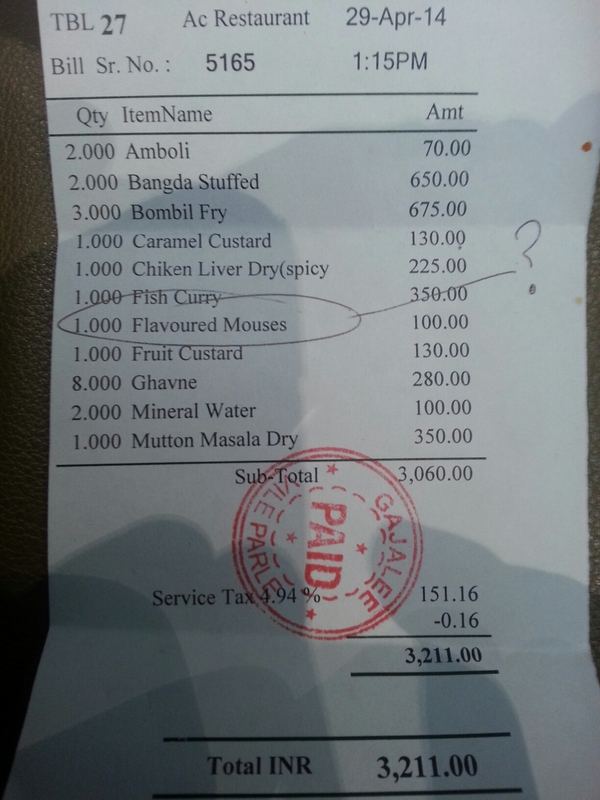 Remind me never to have dinner at those very dubious restaurants you seem very fond of going to! Are you sure you are not tempted by flavoured mouses?